When you hear a musician play who stirs your soul and at the same time is so in command of her craft that she makes it look simple, you know you are in the presence of a true artist. Sharon Isbin has made the intricate art of performing classical guitar look simple. 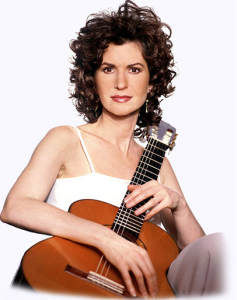 Considered the leading classical guitarist of our time, she was named “Best Classical Guitarist” by Guitar Player magazine and is the first guitarist in over 43 years to receive two classical GRAMMY Awards (in 2001 and 2010). A former student of Andrès Segovia and a graduate of Yale University, she has played at the White House and Carnegie Hall. Her rise to stardom as a woman playing an instrument that is usually played by men was chronicled in Sharon Isbin: Troubador, a recent documentary on her creative performances and collaborations with artists in a variety of genres that was released last fall by American Public Television. She has also expanded the repertoire of classical guitar, persuading leading composers such as John Corigliano to create classical guitar music for her to play with their orchestras. Called the “Monet of Classical Guitar,” she is known for her ability to express different colors or emotions through her music. As head of the guitar department at the Aspen Music Festival and The Juilliard School, Isbin has developed an original technique for teaching classical guitar. Yet she doesn’t limit herself to classical music—she has embraced a musical palette that ranges from bossa-nova to jazz to folk, collaborating with other guitarists and musicians in new ways. For instance, her 2010 GRAMMY award-winning Journey to the New World is an exploration of folk music beginning in the 16th century British Isles, Ireland and Scotland, and crossing the ocean with the immigrants to the New World. “Its centerpiece ‘Joan Baez Suite’ was written for me by John Duarte and inspired by music Baez made famous in the early part of her career. When Joan heard it, she offered to sing on the album, and performs beautiful renditions of “Wayfaring Stranger” and “Go ‘Way from my Window”. Virtuoso country fiddler Mark O’Connor concludes the journey joining me in the folk suite he wrote for us.” At 58, Isbin is not slowing down. How does she have the energy to continually expand her repertoire and explore new ground by collaborating with so many other top artists? It turns out she has a secret.